The Dark Phoenix trailer is finally here. Fox has made fans of the franchise exercise a whole lot of patience with this one and at this point, it's curiosity driving the desire for footage just as much as it is impatience and excitement. Now, we have our first good look at the upcoming X-Men movie which hopes to atone for the sins of 2006's The Last Stand. Whether or not this movie is successful in that respect remains to be seen, but we finally have some idea of what to expect. 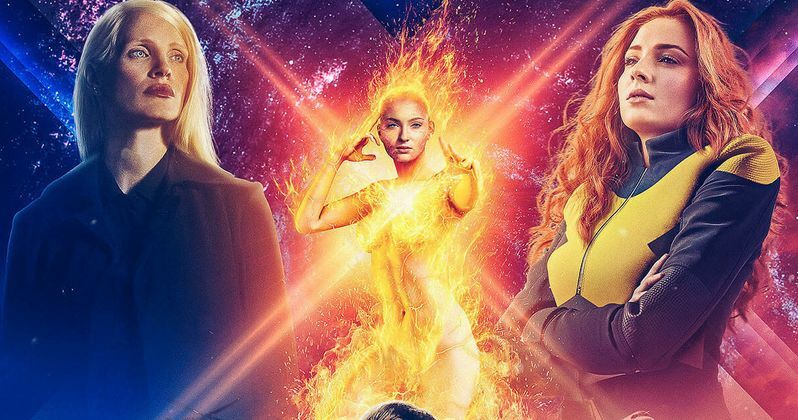 A version of this Dark Phoenix trailer leaked online, in one of the worst bootlegs we've possibly ever seen. For those who held out to watch the real deal, they've been rewarded. The footage makes it clear that this is very much going to be Jean Grey's story. We see flashbacks of her as a child, revealing the destructive potential of her powers dates way back. Much of what is going on is rather ominous. The mutants gathered together at a funeral, Jean at a cemetery. There are shots of Mystique, Professor X and many of the mutants we've come to know over these past few movies. Others we haven't. We even get an unhelpful look at Jessica Chastain's mysterious villain. It's the big reveal of the Phoenix at the end that should have fans buzzing. In Dark Phoenix, the X-Men face their most formidable and powerful foe, who also happens to be a friend, Jean Grey. Following a rescue mission in space, Jean is nearly killed by a mysterious cosmic force. Upon returning home, she is far more powerful and equally unstable as a result of this cosmic force. Wrestling with this entity inside her, Jean unleashes the full range of her powers, without the ability to contain them. Her spiral winds up hurting the ones she cares for and threatens to unravel the X-Men. Despite this, the mutants must find a way to unite, not only to save Jean, but to save the planet from aliens who wish to weaponize this power in order to rule the galaxy. This latest X-Men movie comes from director Simon Kinberg. He previously served as a long time writer and producer of the franchise, but with Bryan Singer stepping away, Fox turned to him to adapt one of the most beloved Marvel Comics stories in history for the big screen. Again. This actually serves as Kinberg's directorial debut and it hasn't been totally smooth sailing, with the release date shifted out of 2018 as a result of ongoing reshoots. But hopefully, all of that work ends up making for a satisfying final product. The cast includes James McAvoy, Michael Fassbender, Jennifer Lawrence, Nicholas Hoult, Tye Sheridan, Evan Peters, Kodi-Smit McPhee, Alexandra Shipp, Lamar Johnson, Sophie Turner and Jessica Chastain. With the Disney merger looming, this could be the last X-Men movie before the mutants join the Marvel Cinematic Universe, making it a rather significant one. 20th Century Fox will release Dark Phoenix in theaters on February 14, 2019. Be sure to check out the first trailer for yourself below.